As part of the BBC's plan to ensure that teams better reflect a modern Britain, RISE (Real Inspiration for Staff at Every level) has been created. The scheme aims to address the development needs of black and minority ethnic staff between bands four to seven. RISE focuses on off-screen talent to ensure we advance equal opportunities and develop our workforce at all levels in order to represent our audiences better. The goal of the programme is for individuals to take time during a 12-month period to really look at their career development under the guidance of a senior BBC mentor. 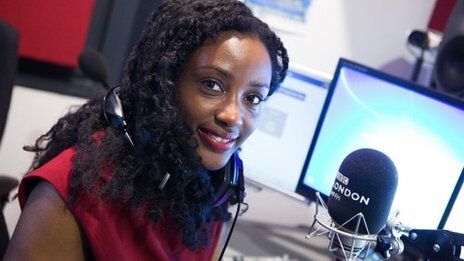 One participant, Abigail Jaiyeola, has been with the BBC for 16 years and found joining RISE invaluable: "I have spent most of my time in local radio as a producer and reporter. I felt my career had stalled after a break for maternity leave and working part time had affected my confidence about applying for new opportunities. "Having completed an attachment to Radio 4's Listening Project I was wondering where to go next - and then RISE was launched. Just being accepted onto the scheme was a confidence boost. "Being part of the project really helped me focus on what I could achieve and made me bolder about career choices. "I am now six months into what was originally only a three month attachment to the Look North regional TV newsroom as a full time broadcast journalist - and I am loving it. "The networking opportunities that have come out of RISE have been really valuable. I was able to ring a head of department I'd met through RISE for some crucial advice before a recent interview. "It's also been good to meet the other RISE mentees and we keep in touch and share experiences." 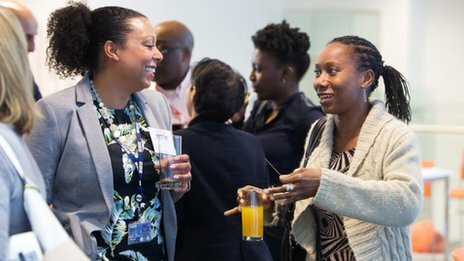 Mentees can also use the extensive network of BBC's Black and Asian Forum (BBAF) members to ask for advice on CV's or BBC job applications, to talk through ideas, plan collaborations or just to find a friendly ear to talk through challenging situations in the workplace. As part of her RISE programme, BBC news Journalist Colleen Harris found the networking aspects gave her the confidence boost she needed, particularly as her mentor is BBC Director, News & Current Affairs, James Harding. "The anticipation of meeting James Harding was as daunting as you might expect. However, the biggest surprise to me has been how down to earth he is," said Colleen. "James is a very perceptive person and is generous with his time and has genuinely shown an interest in my development. "Having spent 13 years in journalism, I felt this experience had earned me credibility. But I had grown increasingly frustrated with getting stuck. "Having James as a mentor has pushed me to make bolder career choices and has given me the confidence boost I needed. "He's taken me to leadership and editor meetings, he has believed in me and my ideas and surprised me one morning with a 'good luck' text on the way to an interview. "I'm now very proud to have had my first report on Radio 4's Today programme and I've just started an attachment with the flagship News at Six and Ten. Prior to this I was on attachment with BBC Radio London 94.9." 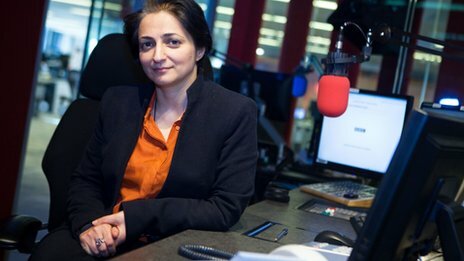 Journalist Shoku Amirani said the scheme enabled her to push herself: "I think the key thing that RISE has done for me is to raise my awareness about my career and broaden my networks at the BBC. "One of the best things about working for the BBC is that there are so many potential areas you could work in. RISE has inspired me to get involved with projects going on across the wider BBC and to think about other ways that I can use my skills. "I found out about RISE by chance one day when I was making a cup of tea and I saw the poster! It was the first mentoring scheme that I had seen aimed directly at black and minority ethnic staff and looked like exactly what I needed. "I grabbed the opportunity straight away and sent off the application form. I was shortlisted for an interview, and I was very excited to get a place on the mentoring scheme. "Because of RISE I am now involved with the Radio Diversity Group and I have already produced two internal panel discussions for staff - one about our roles and responsibilities as broadcasters in covering stories about Muslims called 'Islam - Are We Getting it Right?' and another about class and social mobility called 'Breaking the Class Ceiling'. "The feedback from staff about these events has really motivated me to do more to help improve diversity and inclusion at the BBC. "The experience I gained working on diversity sessions also proved invaluable when I applied for the role of events producer for GWIN (Global Women in News) in which I was successful and I'm very much looking forward to starting my new job in September. "Being part of RISE has really given my career a new lease of life and taken me in a new direction." RISE is a BBAF sponsored programme, supported and facilitated by the BBC Diversity and Inclusion team based in BBC Birmingham. For more information about the RISE programme, and how you can be involved, contact Senior Project Manager Winston Phillips.